What do you do if you're a teen and you don't have the ‘ideal’ body? What do you do if you're overweight, underweight, or just want to get rid of a little excess fat? Is it possible to lose weight while going through puberty? Or are you stuck with the body you have until you grown out of it and into adulthood? Healthy weight loss for teens needs to take into account more than just diet and exercise. Your body is going through changes that can affect how much and how fast you can lose weight. You can change your body in your teen years. But how much you can change it depends on a number of factors. Some of these things you can control and some you can't. You may not realize it, but puberty can have a major effect on your weight and the shape of your body. Both girls and boys can expect to gain weight as well as height during puberty. Hormones released during this time often cause boys to gain muscle and girls to experience an increase in body fat. These changes are normal but may make you feel like you're overweight, even if you're not. You may often wonder: "Why don't I look like my friends?" One reason is that your genetic makeup is different. You inherit a number of things from your parents such as where you store excess fat on your body, how tall you are, and the shape of your body (such as being pear-shaped or apple-shaped). In fact, if your parents are overweight, that increases the risk that you'll be overweight as well. While puberty and genetics are things you can't control, what you eat is another story. Eating french fries, fast food, sodas, chips, and sweets on a regular basis and avoiding fruits and vegetables like the plague can add excess calories without much nutrition. One reason that weight can be such a problem for everyone from teens to adults is all the sitting around we do. Inactivity has a major effect on your waistline and your health. In fact, watching TV is the most common activity that can lead to weight gain (if you don't exercise or eat right) and is something teens usually do more and more as they get older. This may seem like a no-brainer, but not everyone needs to lose weight. Too often, teens focus on getting their weight down to unhealthy levels in order to get that 'ideal' body—something that can lead to yo-yo dieting or even eating disorders. It’s easy to have a distorted view of what your body should look like, especially if your models tend to be, well, models, celebrities, or other people who are often known more for how they look than what they do. So it's important to understand what a healthy weight range is and, even more important, that your scale weight doesn't always tell the whole story. A scale weighs it all: your bones, fat, muscles, internal organs, what you ate or drank earlier...everything. It doesn't accurately tell you what you've gained or lost, so using a scale as your only method of tracking progress isn't always the best idea. Teen Quiz – Am I Fat? You should also talk to your parents and your doctor about any weight issues you may have and about whether losing weight is something you should be concerned about. You might also wonder if you can lose weight from a specific area of your body. Maybe you don't like your thighs, or your hips, or your belly. So, is it possible to lose fat from these areas and, if so, which exercises work the best? The truth is that spot reduction won’t work. That means that doing hundreds of crunches to get flat abs or leg lifts and squats to get thin thighs won’t work. So, if that doesn’t work then what does? To lose fat, you have to burn more calories than you eat and then allow your body, and your genetics, to decide where the fat comes off. The most effective way to do this is with diet and exercise. Choose things you like. If you’re not into team sports or outdoor activities, try workout videos or fitness video games, like Dance Dance Revolution. Make it a regular habit. Try setting aside time each day for exercise so it becomes a natural part of your routine. Look for ways to move more. Make extra laps around the mall, walk to your friend's house, or turn on the radio and dance around your bedroom. Finding ways to move more will add up to burning calories and being healthy. Get some help. If you want to exercise but don't know where to start, talk to your parents to figure out if you can join a gym, work with a trainer, or exercise with them on a daily basis. Learn more about Teenagers and Exercise for specifics on exercise and strength training. Aside from being more active, watching what you eat is another important component of losing weight. You may find it useful to enlist the help of your family and friends to improve your eating habits. Watch your beverage choices. Too many sodas, juices, and sports drinks can really add up. Replace them with water and you'll save plenty of calories. Fill up on fruits and veggies Most fruits and vegetables are high in fiber and nutrients while low in calories. That means you'll fill up faster and eat less. Try having fruit as snacks or before meals to cut calories without feeling hungry. Skip fast food There's nothing wrong with having an occasional burger and fries, but avoid having those types of foods every day. Make them a treat that you only have every now and then. Avoid mindless snacking If you get hungry in the afternoon, keep your snacks healthy by avoiding candy, cookies, and other tempting sweets. Also, pay attention to other reasons you may eat, like being bored, tired, or feeling blue. Emotional eating only makes things worse and doesn't make your problems go away. Lastly, one of the biggest mistakes many of us make is trying to find shortcuts or quick fixes to lose weight fast. These kinds of shortcuts can quickly backfire, and some can even be dangerous to your health. All of us get the urge to skip meals, especially if we’ve eaten too much early in the day. But skipping meals can backfire. You may eat even more calories at your next meal and, because you're so hungry, you'll be more likely to eat junk food (when you get that hungry, a salad just won't do the job). It can be tempting to follow liquid, low-calorie, or other extreme diets that throw out entire food groups in order for you to lose weight fast. But, again, these types of diets often aren't healthy and may end up sabotaging your efforts to lose weight. When you don't consume enough calories, your body actually holds onto fat in order to fuel itself. Plus, much of the weight you lose initially is water – not fat. Aside from that, you may not be getting all the nutrients your body needs to grow in a healthy way, especially in your teenage years. It's also tempting to take diet pills in order to lose weight fast, but most of them aren't regulated which means there's no guarantee of the quality or safety of what you're taking. Many of these pills have nasty side effects, and a lot of them don't even work. There's no pill out there that will help you lose weight permanently, safely, and effectively, and anything you take should be prescribed and/or managed by your doctor. These supplements are often touted as "natural" ways to burn more fat but that doesn't mean they're safe. The truth is that, like many diet pills, they aren't regulated, may not work, may interfere with other medication, and may even be dangerous to your health. Avoid anything not prescribed or recommended by your doctor. Exercise can be a healthy way to manage weight, but too much can cause problems both physically and mentally. Some people even exercise so obsessively that it's considered a type of eating disorder. A balanced exercise program means getting some activity in each day and having a variety of workouts in your target heart rate zone. Exercising for hours a day at high intensities can be just as bad as not exercising at all. Though you may want to lose weight fast for the summer, the first day of school, or that beach vacation, there are no shortcuts. Healthy weight loss is a gradual process. Though a quick fix may temporarily help you lose weight, it will only come back once you go back to your normal routine. And remember, if you start exercising and eating right, the scale won't always reflect the changes your body is making. It's possible to gain muscle and lose fat, which won't show on the scale even if it shows in how your clothes fit. And what if you want to gain muscle? 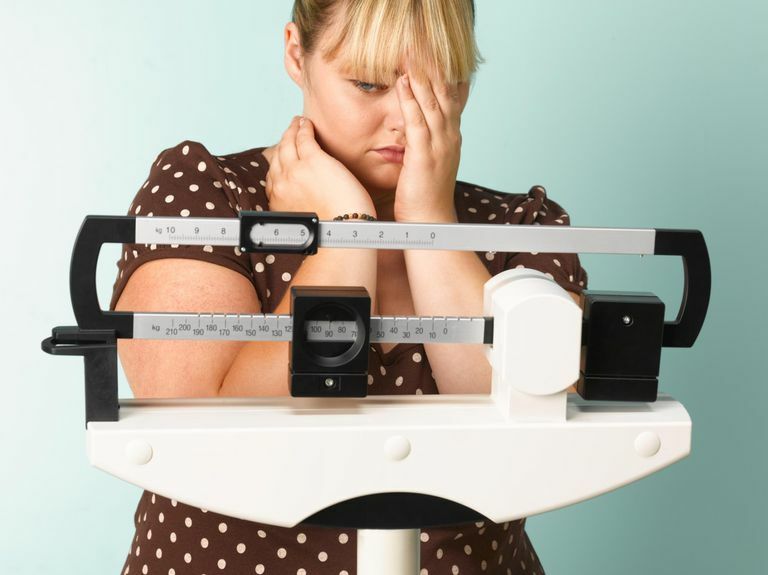 While a lot of people want to lose weight, some teens feel they're too skinny and want to gain weight or muscle. First, everyone develops differently and many teens find that, over time, they start to fill out and gain more weight naturally. In fact, many experts don't recommend that teens try gaining weight by eating tons of calories – that could lead to gaining more body fat, which isn't healthy. Some teens wonder how to bulk up, which is another goal that's even tough for adults to reach. Most studies have shown that children who do resistance training may gain strength, but not muscle bulk, according to the ACSM's Guidelines for Exercise Testing and Prescription. In other words, many kids and teens will find it tough to gain lots of muscle mass. That doesn't mean strength training is a bad idea – under supervised conditions (with a coach or expert), kids can get strong and fit with the right kind of routine. But making drastic changes in muscle mass at that age (or any age) is something most won't achieve. Whatever your goal is, it's important to be realistic about the changes you can make to your body. We're all products of our genes and our lifestyles. We can change how we live, but we can't change the basic makeup of our bodies. By focusing on changing what you can and allowing your body to respond to that, you can create healthy habits that will move with you into the future.